Besides just buying bolts pre-drilled anyone drill their own? Is it worth it? Any recommendations on brand of drill fixture & bits? You’re better off just buying what you can. I’ve drilled a lot of my own in the past. I used coated bits and a drill press I have in our lab at work. The benefit is obviously $$$. And time. You’re not buying more stuff, and if you need that bolt today,... you can just do it yourself today. The downfall,.. well most professionally drilled bolts are going to have the edge breaks where the hole is drilled. In other words it’s not a sharp corner at the edge of the hole. This sharp corner will eat away at the safety wire over time and the safety wire will break. The ones you buy, with edge breaks, will have a smooth transition at the edge of the hole and will allow the safety wire to perform the task which it is supposed to do without breaking. Sorry for the long explanation, I can show images of what I’m talking about if you want. Of course if there is no bolt with a predrilled hole, you’ve gotta do that one yourself. First this that comes to mind is the front sprocket bolt. Thanks! You mean the countersinking or chamfering. Was watching some vids. Hmmm ok thanks for info. The drill fixture looks good but also saw some drill without. I have drilled a few myself and just takes time. Even drilled a small Ti one that holds the rear brake fluid tank to take some weight off it just for fun. Nothing to do with safety wire I just took 1 gram out of it. On a serious note good quality lubrication is your friend when drilling. I have some especially for the job just cannot remember the name. Quality drills, puncher, good setup helps a lot. But i’ve also drilled them on the bike, so there’s that. On racebikes it’s rather more wired than less. 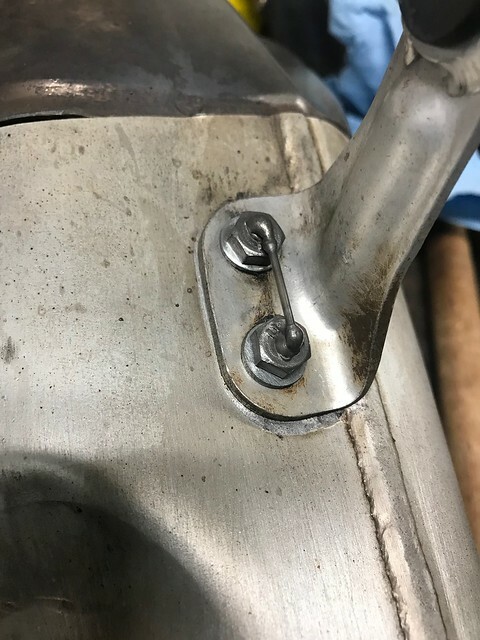 After coring my stock mufflers I tried drilling 6mm x1.0 bolts (grade 10.9) but my 1/16" bit kept walking.Without drill fixture but on a press. Finally gave up and not something I plan to remove again anyway. Lol. I work in aviation as a helicopter mechanic. yardstore.com has lots of great tools.